We recognize the comfort and efficiency needs your family has. 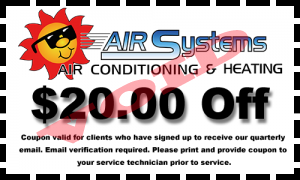 Air Systems Texas specializes in residential AC & Heating. We offer repair, installation and maintenance on all brands of air conditioning and heating equipment. Our certified technicians will arrive in fully stocked vans. Equipment unable to be stocked is available same day in most cases. All technicians conduct themselves in a Christian manner. For residential AC & Heating, Air Systems Texas is at your service! Our residential AC & Heating services are the best in Houston. We stand behind the quality of our work with a 100% MONEY BACK GUARANTEE ! You won’t find service like this anywhere else!